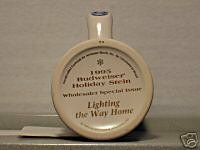 CS263GOLD Budweiser 1995 Holiday Mug Lightning the Way Home WHOLESALER EDITION Sixteenth in series, 1995 issue date, Edition Quantity Only: 1,500 Height: 6 3/4", Origin: Brazil, Manufacture: Ceramarte, Material: Ceramic, Special Features: Certification of Authenticity, Bottom Stamped, Gift Box, Artist: Tom Jester Condition: NEW in Gift Box see picture (no chips or cracks). Policies; 1) Buyer will pay shipping charges (insurance and delivery confirmation included) (shipping to lower 48 states USA). 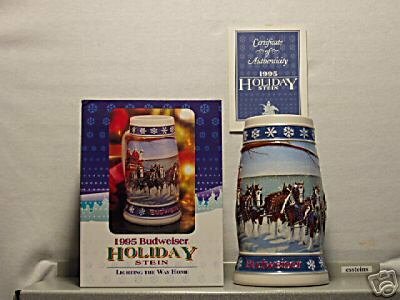 2) If you are purchasing more than one stein/mug you can save on shipping. Addition shipping per item is 5.95. All items to be paid at same time and items will be shipped in same box.